Archangel Gabriel is known as the angel of revelation or announcement. He plays a significant role in Christianity, Islam, Judaism, and many other faiths, acting as a messenger for God. In the Bible, Gabriel can be found in the books of Luke and Daniel. He is also known as the "Christmas Angel," for announcing the coming birth of Jesus to Mary and the shepherds. It is believed that Gabriel can be recognized by a white or copper light and that he often delivers his messages to people in dreams, acting as their guardian angel. When you get sudden insights that give you valuable guidance for the future, it may be Gabriel sending you a message. As the angel of water, one of Gabriel's specialties is communicating a sense of clarity. Doreen Virtue's book "Archangels 101: How to Connect Closely with Archangels Michael, Raphael, Uriel, Gabriel and Others for Healing, Protection, and Guidance" offers a glimpse into this. "Gabriel," Virtue writes, "often announces what's on the horizon, and acts like a manager or agent in orchestrating new ventures related to one’s soul purpose." Author Richard Webster writes that "Gabriel aids visions, and can also help you get glimpses of the future...If you feel trapped, locked in, or are simply in a rut, call on Gabriel to help you change and start moving ahead again...The gift of prophecy can be yours, if you ask Gabriel to help." If an idea about how to solve a challenging problem comes to you (especially after praying for a solution), it may be a sign that Gabriel is with you. "The most usual form of communication is for thoughts and insights to come into your conscious mind. Ask Gabriel to clarify anything you do not understand. By the end of the conversation, you should know exactly what to do." Gabriel often visits people while they're dreaming. For example, Christian tradition says that Gabriel is the angel in the Bible who tells Joseph in a dream that he will serve as the father of Jesus Christ on Earth. "You should awaken with a dream-world memory that contains the solution (or a seed to the solution) to your problem. Sometimes you will not remember having a dream at all. Yet the answer to the problem will come to your conscious awareness later in the day." Gabriel often hopes that his appearances in people's dreams will inspire them to pursue greater purity in their lives, write the Miller-Russos. 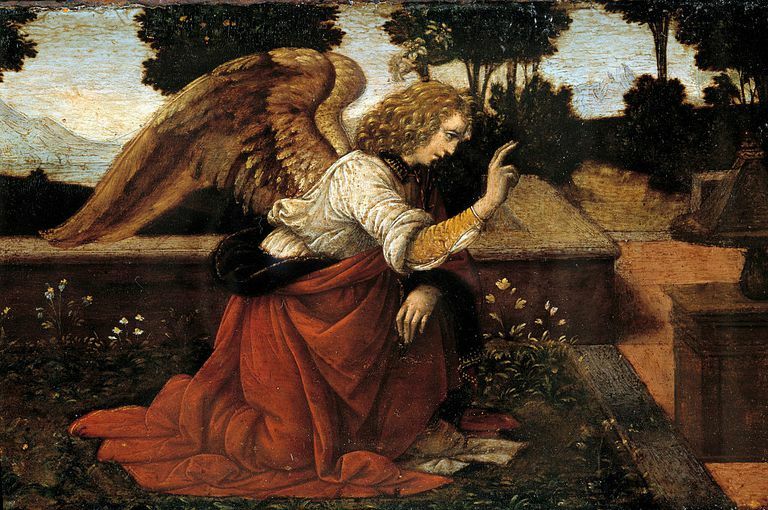 "Gabriel has appeared to people as both a male angel and a female angel. When meeting him, one can sense the purpose that emanates from him." "Purification of the self builds strength and opens the channels of communication between you and the beings on the higher planes. The wisdom of your guardian angel, the archangels, and your spirit guides is more easily understood and integrated by those who devote themselves to the purification of their heart and mind." Many people say that they feel challenged to take on a great responsibility when Gabriel communicates with them. Historically, the messages that Gabriel delivers often ask people to do something for God. Religious texts record that the people whom Gabriel visits sometimes feel troubled when they ponder his messages. The Qur'an says that it was Gabriel who miraculously revealed the truth to the prophet Muhammad. He wrote that Gabriel's visits to him were stressful and challenging. George W. Braswell illustrates this in his book "What You Need to Know About Islam and Muslims." He writes that "[t]here was physical and psychological stress upon Muhammad as he encountered the angel Gabriel, who gave him the words to recite." "The angel Gabriel appeared to him several times. The prophet was later to report that the angel sometimes appeared to him in his angelic persona and sometimes as a human being. At other times, the prophet would hear a bell-like sound and revelation would come suddenly, requiring of him such extreme concentration that he came close to asphyxiation." When Gabriel appeared to the Virgin Mary to announce that she would serve as Jesus Christ's mother on Earth, the Bible records that Mary was uncomfortable at first. "Mary was greatly troubled at his words and wondered what kind of greeting this might be" (Luke 1:29). In her book "Women in the New Testament," Mary Ann Getty-Sullivan describes this encounter. "The angel Gabriel appears unexpectedly...After greeting Mary, the angel begins the message from God, saying 'Do not be afraid.' The attitude of awe or reverence, expressed as fear, is typical for those who experience an epiphany...Mary is troubled at hearing the greeting of the angel. Her confusion is based on both the appearance of the angel and on what the angel has said." You may see either white or copper light around you when Gabriel is nearby. Believers say that Gabriel's electromagnetic energy corresponds to the white angel light ray and his aura is a copper color. In her book "Psychic Children," Joanne Brocas writes that "Archangel Gabriel is associated with a beautiful white light and this color brings purification to wherever it is needed. Imagine this white light enfolding and surrounding you and your child and ask that it help dissolve any stress or worries that may be affecting either of you." Gabriel is typically portrayed with a large copper trumpet, signifying his delivery of messages. He is often identified by a copper-colored halo or flashes of copper light. Some people also believe that a sudden and unusual attraction to objects made of copper is another sign that they're working with Archangel Gabriel.